Dairygold milk supplier, Mr. Kevin Downing from Whitechurch, Co. Cork was declared overall winner of the 2017 Dairygold Milk Quality Awards. 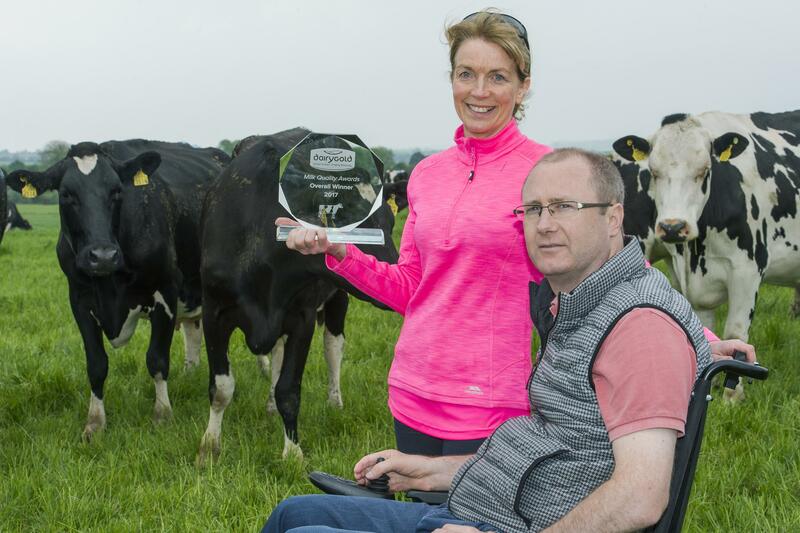 The award presentation took place at Springfort Hall Hotel in Mallow on Thursday night where Kevin and his wife Bernie were awarded for consistently supplying the best quality milk to Dairygold throughout 2017. Kevin has carried on an excellence in quality from his late father Michael, who won the same award in 2010 and sadly passed away three years ago. The Downing farm located a few miles north of Cork city has a strong history of achievement in dairy farming. Kevin, his wife Bernie and Farm Manager Tom Carr, produce manufacturing milk and sell dairy stock from 160 pedigree Holstein Friesian cows. The judges declared that while all 18 finalists demonstrated exceptional quality, the Downing farm was an excellent example of what good management and high standards of production can achieve with cows producing over 560kgs of solids at 4.3% fat and over 3.6% protein and a low average SCC. The Downings had also been awarded the Overall award for the East Cork region earlier that night. The Awards were based on 2017 milk quality data for all 2,900 Dairygold milk suppliers across counties Cork, Tipperary, Limerick and Clare. A shortlist was drawn up of three suppliers from each of the six Dairygold regions. These 18 finalists underwent adjudication by two independent judges Dr. Karina Pierce, University College Dublin and Mr. Don Crowley, Teagasc dairy specialist. The judges visited all 18 shortlisted farms to review their farm enterprises first hand. The review takes account of Milk Quality, Dairy Facilities, Herd Health and Welfare, Sustainability and General Efficiencies and Farm Health and Safety. The Judges chose six regional winners and the overall winner was announced on the night. The overall runners up were Thomas Horan from Cashel, Co. Tipperary and Timothy Roche from Dripsey, Co. Cork. Guest speaker on the night was Professor Thia Hennessy, Dean of Cork University Business School, who gave an insightful address on Cork University Business School, its plans and ambitions and the long-established association between UCC and Dairygold.